For some people, talking finances with their significant other is almost as awkward as asking your friends how much money they make at their jobs. But if you think about it, getting insight on your loved one’s money matters is as natural as wanting to know more about their personality, likes and dislikes, interests, and worldviews. In many relationships, one person is usually a spender and the other is a saver. Therefore, you will probably have some disagreements about what constitutes a worthy purchase and what doesn’t. Additionally, you both may have been raised with different perspectives about money. The important thing is to recognize this and to not be resentful if your partner doesn’t share the exact same views on finances as you. Also, one of you may be smarter with money than the other. If that’s you, don’t belittle or look down on your significant other for not having your knack for finances. Everyone has different talents and perhaps yours is coupon-clipping, knowing the best credit cards to apply for, and navigating the stock market. If you’re only in the beginning stages of your relationship, it’s not super important for you to know the ins and outs of the other person’s spending habits. But as you grow closer and begin to think of your money as “our money,” it’s time to be more open and honest. 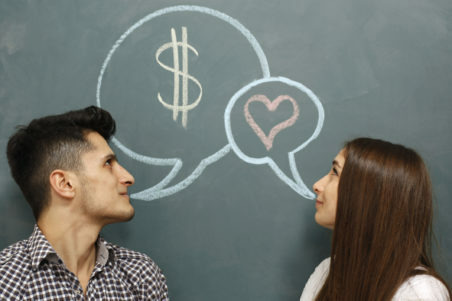 Financial infidelity might not be as big of a deal to you as relationship infidelity, but how would you feel if you knew that the person you love used a big chunk of your shared money to buy something expensive (and frivolous) without your knowledge? If your salary is significantly less than that of your partner, the feeling might sting more; you already know the difficulties of creating and adhering to a tight budget. Make an agreement with your partner to always be transparent about major expenditures. You likely already have shared many of your hopes and dreams with your S.O., and a lot of your goals will involve some amount of money. Just as you would discuss your ultimate relationship goals with a prospective life partner (moving in, marriage, kids, buying a house, etc. ), disclosing what sort of long-term future you see for yourself is an important element to ensure the success of your relationship. If one of you values buying a house more than having a big wedding, that’ll be good to know before you get engaged. Or, if one of you wants to have X amount of dollars in your savings before starting a family, you’ll need to budget accordingly. Before you panic at the thought of your loved one spending what you feel is an unjustifiable amount of money on a new car, press the pause button. Wise financial decisions aren’t always based on price tag alone; you have to consider the value of the purchase in question. In this example, you’d want to think about the quality, mileage, safety features, and lifespan of the car your partner is hoping to buy. The same principle applies to less major purchases, like a winter coat, a weekend getaway, or a charitable donation. You might experience trouble in paradise if you start talking about money too soon into your relationship. For those in newer relationships, wait until things become more serious before approaching the topic of money. Just remember that just like any other conversation with your significant other, say what you need to say with clarity, respect, and an open mind.